The Mind Diver is Captain Drake Marko. 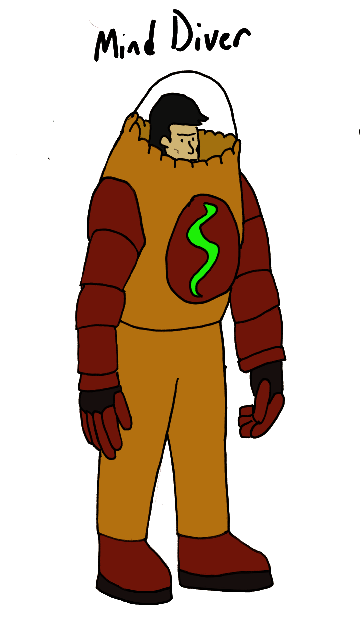 Drake wears the suit made from the remains of a giant imaginary monster that was captured and killed by the military. Since the creature was imaginary, its natural habitat is in the mind. By wearing the suit, Drake can dive into the thoughts of anyone and mess things up in all sorts of ways. In this manner Drake can interrogate enemies for information, or attack targets from a distance via dreams, or even reach into a comatose person’s mind to help them out. If the military needs mental dirty work done, the Mind Diver is there to work those dirty minds… or something. I don’t picture Mind Diver being a particularly imaginative. 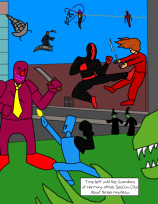 The suit does all the work for Drake, but opponents would be relying on their own mindpower. With that in mind, I picture Drake as one of those unlikeable pompous blowhard characters that you need to have now and then. Probably Drake would work best as a supporting character somewhere else. Getting a brain in there is one of the most important parts of making a frankenstein. But what happens if you put More Than One Brain In There!!!???!!! The Gravedoctor is the result of such an experiment. A mad scientist crammed in as many brains as he could find into his frankenstein to see what would happen and the result was a kind of Frankensteingularty. 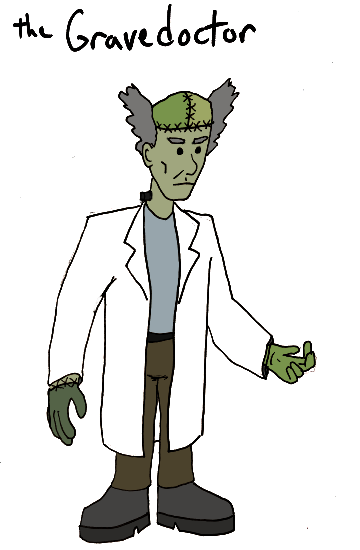 Smarter than his creator, the Gravedoctor took over the lab and started his own mad science work. Creating more frankensteins to serve under him, the Gravedoctor begins a quest to learn the secrets of the universe. But that kind of work requires more workers. But when the supply of bodies at the local graveyard runs out, where is the Gravedoctor going to get the body parts he needs to going? Well, it’s time to start making more bodies out of all those people who are around. Can the world survive as a growing horde of frankensteins sweeps across the globe? Only time will tell.